When T.S.Eliot wrote about the world ending without a cataclysmic event he was not talking about the doom of the Warhammer World. 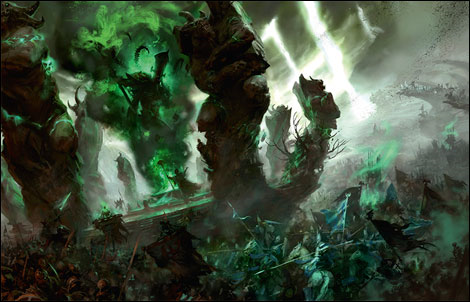 Ending spectacularly with the destruction of the world, the Warhammer Fantasy universe concluded explosively, with a new universe taking its place. The Age of the Warhammer World was over, and the Age of Sigmar has begun. Veteran Warhammer players enjoyed the Warhammer universe because it had wonderful depth, and had a rather dark and gritty feel to it. The models to accompany the universe were arguably the best miniatures in the world. Rules-wise, many of us felt that they were reasonable but could be improved upon. 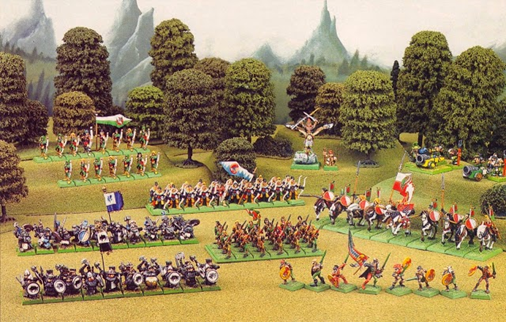 Towards the end of Eighth Edition Warhammer Fantasy Battle, many of the armies were brought up to date and they were more balanced than we’d seen since the Ravening Hordes version at the outset of Sixth Edition. Things were not all wonderful in the garden however. Games Workshop were acutely aware of the vulnerability of their Warhammer Fantasy Intellectual Property which itself was based heavily on the worlds created by Tolkien and Dungeons and Dragons. In addition, Warhammer Fantasy Battle simply didn’t sell particularly well, and there were many barriers to entry – particularly for the new wargamer. Barriers included the high model count (meaning high cost) and rules that were occasionally complex and always voluminous. 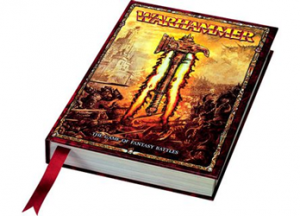 Games Workshop decided that the best solution would be to close this chapter on the Warhammer World, and start afresh. Over the space of a series of sourcebooks which provided some wonderful new fiction and artwork, not to mention interesting rules and scenarios, the End Times story developed a punishing narrative for the Warhammer World until its final destruction. All eyes were on Games Workshop for the next edition of Warhammer Fantasy Battle and all players eagerly awaited the next instalment in the series. 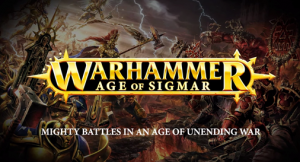 The Age of Sigmar rules were released without charge on the Games Workshop website with much fanfare among the gaming communities. A new offering, an entirely new proposition, was launched – one that bore almost no resemblance to what had gone before. Entirely removed were hefty tomes of rules, replaced with four pages of text. Out the window went ranked units, replaced with individual models on round bases. A new world was being developed and built, with new narratives formed. Reaction from players varied widely. Many lapsed players saw this as an opportunity to return to the game and dusted off old models. New players applauded that the game was far easier and cheaper to get started with. Every wargamer has had a moment where the game became a hobby. My moment was reading a battle report in White Dwarf in early 1992 which included the army above. I loved the ranked units, the tactics and strategy and the wonderful models and terrain. It captured my imagination of how a wargame should look and feel, and I’ve been biased towards that aesthetic and those mechanics ever since. 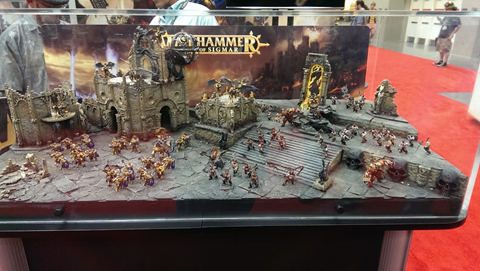 Age of Sigmar doesn’t look or feel the same as this, and the game has moved in a different direction. Without the game aesthetics and ranked unit strategies, and with the destruction of the World that was developed over three decades the game lost a lot of its stickiness for veteran players. One of the games that retains much of this is Mantic’s offering – Kings of War – and many veteran players have found refuge here. Written by Alessio Cavatore, who penned many rules sets for Games Workshop,the game has a very familiar vibe to Warhammer Fantasy Battle. The rules are simple, but allow enough room for grand strategies and tactics on the tabletop. Mantic’s models range is developing and is not at the same level as Games Workshop’s at present. Thankfully, Mantic are happy to allow players to use non-Mantic models for their game – even at their own events. 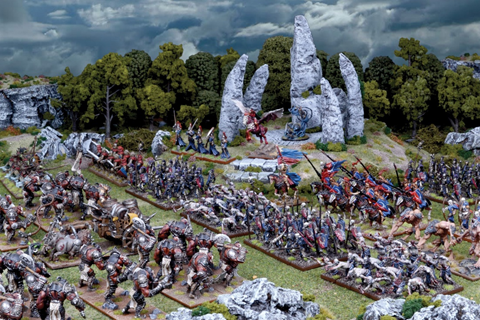 Many of us are using Games Workshop models in Kings of War and it’s very straightforward to port entire armies from Warhammer to Kings of War, so the transition is very easy and smooth – certainly an added bonus! The world of Mantica certainly has room to grow and needs to develop its depth. Right now, the world doesn’t feel as iconic as the Old World or Ulthuan did in the Warhammer setting. Recent releases have improved this, but there’s some distance left to go before the Mantica world has that epic feel. One important thing for Irish gamers is the availability of games. While the Kings of War community is relatively small and new, it’s developing well with five events scheduled in the first half of 2016. Alongside this, many gaming clubs have growing Kings of War player bases, which is hugely encouraging for those of us who enjoy the game. For anyone looking for alternatives to the Warhammer World, there are many new options including Dragon Rampant and Frostgrave which are well worth a try. 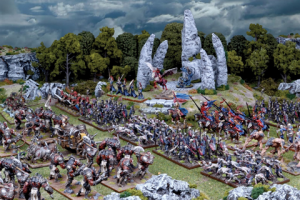 Kings of War ticks many of the boxes for this veteran gamer including being elegantly simple to learn, allowing old collections of miniatures to be fielded en masse – and having a wonderful feel of large unit strategies throughout!